MAY 2007; still maybe too soon to get permissions from the Messiah on Posting those RARES that are STILL COMING? A MODEST PROPOSAL for the CREATION of POETRY IN MOTION: RE: THE BREEDING of the MODERN FANTAIL. YESTERDAY, THE 30th of JULY, 2007..I CRIED, and Cried as the pain shreked through out , Physically and Mentally.. THE PAIN! ; Today you are gone: OH BATT..ON MAN.....I got thru today, but the pain is even Greater than Yesterday.. OH SKINNER FANTALE MAN.......From Hence we write as we often spoke to the greatest ILLUSION created BY HISTORY, and NOW ; FROM IT.. to points of Knowledge beyond that of DARWIN, C.A, HOUSE; ONWARD , beyond History..into this mellennium, you have THRUST ME; EYE can never be the HISTORIAN, that you were; EYE can never Be THE BREEDER ; but EYE CAN carry on.. PAGE THREE THEN......??? to be continued .....07/31/2007.. BEYOND HISTORY BEYOND DARWIN BEYOND HOUSE I LED THEE.. into 2008 BREEDING SEASON...I COULD NOT SLEEP; I COULD NOT WORK; I cannot SLEEP.. and I will NOT WORK, until I have placed the final Saga.. here.. in your Honour. EYE WILL TAKE THEM..BEYOND the HISTORY, beyond the FOREFATHERS.. TO THE FATHERS, of which YOU ARE ONE..THE ONE. First presented to Us from BP in a photo. 'NV' was selected by BPOGUE, to be the FOUNDATION of the ULTIMA and the INSPIRATION from / working with: JOHN ARENA of AUTRALIA. INSPIRATION, came after THE ULTIMA, so we think, tho we gave OUT OUR OPINION; the Work was already done from the Minds EYE of BRIAN POGUE; also seen in the BROWN MODEL, from LANCE CHRISTIANSON, as well, the ULTIMA and the INSPIRATION were both Rendered from NV the GRAND CHAMPION from the LOFT of DANI FALCONI. ALL THAT REMAINS is for US to set the UNDER-CARRIAGE, specifically for the TYPE ONE, 'THE POGUE "PROFILE" THAT has led THIS FANCIER to the CREATION of the MODERN MELLENNIUM FANTAIL. WHERE THE BRIAN POGUE TYPE ONE, will, and HAS, IN LOFTS NORTH OF THE MASON DIXON LINE become the STANDARD by which THE MODEL will FOLLOW, as it is Animated, to show US the Mechanics/ the Physical attributes that will create THE TYPE ONE to the TYPE THREE PHENOTYPE, that has come from THIS FAMILY. and which IS the MODERN MELLENNIUM FANTAIL..THAT IS THE HISTORY ! to be continued and HAIL to the QUEENS.........of this FANCY, and of THE UK. TO THE UK, for A HISTORY that LED US HERE, TODAY; for their HELP in doing SO; TO JOHN BRAGG of THE FANTAIL CLUB of BRITIAN and of SCOTLAND..UNITED; WE STAND, divided WE ????? THE CANUCK TEAM is second to NONE in this WORLD......SO BE IT HAIL TO NV , to her Meat and Feather as the FOUNDATION upon which: ALL that is TODAY, the Modern FANTAIL is seen OF HER. THE so called, when we started out, in color breeding, THE "UNIMPROVED RECESSIVE RED" was a SELF that moulted BLUISH. Today, we look at this as Ember( Em) It acts like EMBER, it moults like EMBER; still, as a COLOUR BREEDER, we need to know how to BREED for GOOD colored Recessive RED SELFS. THE BLUE checkers were used to improve TYPE; the result was BLUISH , and loss of RICH REDS. Again, this is where we don't question the Geneticist ; but we look to create the GOOD colored RED SELF. WE wanted to use the Best colored BLACK SELFS, because they were CT//ck..at least CHecker without Bar pattern; and this was improving the TYPE, but the coloration was coming, but not getting there; because we Were looking for TYPE and color in the same Family. Then we went to a Color family, and a TYPE FAMILY.. and so to EACH , to create both TYPE Perfection, with great colouration. Didn't happen!! MIMIC BLACK, THE BLACK KITE with little BRONZING SHOWING are ABLE to cover UP the BLUE BASE, and with Pattern set at ultimate CT//CT..YOU will have the BLACK SELF that BIG BOB mentions . We have found that this is the correct BASE? KITE, base? without any BLUISH, or PLUMBINESS A N Y __WHERE! to produce the SELF, no matter the Color. With this MINIC BLACK,NON SPREAD FACTOR BASE, COVERING THE BLUISH COMPLETELY; with the Covering of the BRONZING is the secret, to not only THE SELF coloration; but also to the CLASSICAL ALMOND. THE BLACK WING will likely create SELFS second to NOTHING in the WORLD of BLUE FANTAILS; where Zwh..the bull eyed white , IS: a BLUE Base. 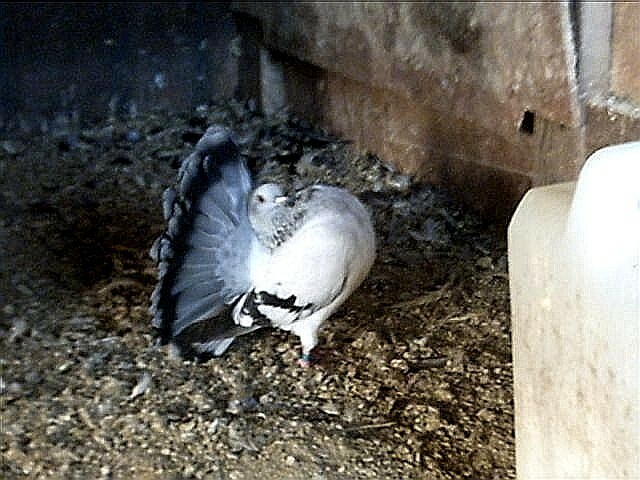 Bodee marks : RE Recessive RED ..pluck tail feathers, but ONCE , just prior to tail growth set'. VIOLA Red Bodee marks. Almond Bodee Marks : With the BLUE base or the NON MIMIC BLACK KITE BASE / primer color.. THE tails will be 'dirty whitish to white as the Blue base becomes as in ICE blue base coloration. AS we ascend to CT//CT, as we go from the blue pigeon to the KITE of SF Tumbler, and ultimately to the UN tainted Black wings Archangels of OLD, we see the andulusian as a Blackened Indigo, without blue gun metal tail coloration. Likewise, we create the Classical Almond, with correct ground coloration, with 3 color break; and the Key Word is BLACK 'FLECKING' .. not bluish Flecking. Adding blue base, and SPREAD FACTOR( not smooth or coarse Spread areas, blue ares.. each, Affected per the prescence of Other color Mutants. Body marks are like any marked birds.. they are NOT acromatosis produced; they are not poor colored; but a Marking set in the genome which creates.. the marking; and so , then a BODY MARK...W H A T ??? A Fantail of , says Hollander, says the fantail JUDGE.. Maybe just their still a coming to TYPE..
And so to the SIXER MENTALITY of SELECTION only for TYPE PERFECTION. Recall the dificulty of the Modena Breeder today, and yesterday.. for the ARGENT( laced) with the TYPE PERFECTION ....BRIDGE CROSS..using Od.. it works as long as we follow the Cross to just ts.. and remove the Od to a separate family.. and our choice is the ASH red ma//+, (ts1//+) with Od//+....these are delights and so easy to produce.. in the White Phase, every time. ( pied white also works.. but, it is best removed with selfs.. after Bridge crosses are established. After ALL.. if we are Scientists we follow the regimen; yea, we are but Creators.. and the McK-Clature prevails.. but then know your POET...and never be lost in nomenclature of the NON Enity. , as we move away from the coolness and of the greeness of a wonderful Spring..thru a BREEDING SEASON and SUMMER..those Lazy, Hazy days of SUMMER. What becomes apparent as we look to them.. SEE them , when given ALL that they Need.. no time for disturbing them on their eggs, or helping one out. The RED HEALTH GRIT, has replaced the Home Formulation for the lack of time to mix; still , it is the Commercial brands they PREFER..and daily, Fresh, as it is, smelling of ANISE and with all or some of the micro-nutrients ( IE Se..for male fertility) should be given DAILY to the Feeders or Parents with Young. We see that Ice Fantales will give Intermediates when crossed to re-establish, or refine the TYPE REQUIREMENTS; that when the Homo Ices are crossed to Project bars they breed Intermediates; while the first OUTCROSSES to Damescene , really.. bred not a single one.. and if it did.. it was Dirty..and it could not be seen; today.. the same crosses of Ice fantails to Project produced bars, checks will give Intermediates; and when the Fantails used, are from the Purest of Stocks.. young come with black squab feet from the DIRTY Factor; still..the ice intermediate will show thru..
Febuary 9th, 2006............THIS PAGE is DEDICATED to ROBERT ( BIG BOB) POMMER. Long over due!!! BOB, was the first Genepooler to set down show TYPE Fantails in the Rarest of COLOURS. THE FANS POSTED from the CUP SHOW: SO EXCITING to see them coming from the Spendor defining their SHOW! A frill stencil( fs//fs brown lace tail fantail from rcbc, Mississippi Say, do you think he feeds oil sunflowers with their fatty acids, and 15% usable protein? FROM THE IOWAY and bred down from original Crosses by Gary and RT. (may 15th, 2006 LOFTS. Damescene Ice BLUEs are in at least FOUR LOFTS in AMERICA: MCKEE,RALPH SMITH,WILLY SHEKLETON,and GARY BRONSON. IT WILL BE: GARY BRONSON WHO DEFINES THE ORIGINAL damescene Colouration,with TYPE GALORE. ICE CREAMS are a delight, but the SELF looking Lavender, a very LIGHT Lavender, Non SPREAD Factor, and looks like a Barless( and might be an allele, or something, or just Directional Mutation? don't know.. Anyway, the combination OF THE so called CINNAMON MILKY, devoid of all defintion for the Bar Pattern, both Smooth and Coarse Spread, coupled with Qualmond, from DR LYNCH, and the ICE will give a Platinum tinged, self Lavender, with icy frosted hackle, and no barring.. even, distinctly look of a SELF. Ralphs ice blues, a pdr ice blue in the background in above pix..